Racing continues to provide the preeminent directive for advancing powertrain development for automakers worldwide. Formula 1, World Rally, and World Endurance Championship all provide engineering teams the most demanding and rigorous testing opportunities for the latest engine and technology designs. Turbocharging has seen significant growth in the passenger car market after years of development on racing circuits. This book provides a historical and relevant insight into research and development of racing engines. 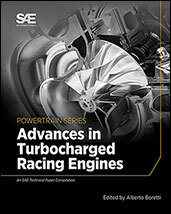 The goal is to provide the latest advancements in turbocharged engines through examples and case studies that will appeal to engineers, executives, instructors, students, and enthusiasts alike. If you do not have access to SAE MOBILUS via username/password or institutional access, you can still purchase the Progress In Technology (PT), Advances in Turbocharged Racing Engines.